Somebody has to shoot down Carl Zone.....in flames. Cookie La Rue wrote: The king is dead, long live the king. At least I'm not last now, eh Cookie? We we should thank Rats for keeping a respectable showing on behalf of the regulars. La Rue is French for crumble. Ashes to ashes, i'll rise like "Phoenix The Devourer" and nothing can hold me on my path called "Rue de dévastation". Mark my words, when all is settled in dust, you (Corn) will not be last and Cookie will be flying above you. Soooooo...... is Rats going to hang on until the end? Cornuck wrote: Soooooo...... is Rats going to hang on until the end? Rats deserves it, please not Carl Zone! Looks good so far for you too, ..... not last. My aim now is the top 10. Carl zone has 2 injuries P Kane and miller. I have 4 miller p Kane e Kane and McKinnon..miller is shortest term. Zone has enough games left to overtake me....I need guys to STEPUP.. Your PPG is 0.810, Carl Zone has 0.800! Jesus h......that's too close....the stress. 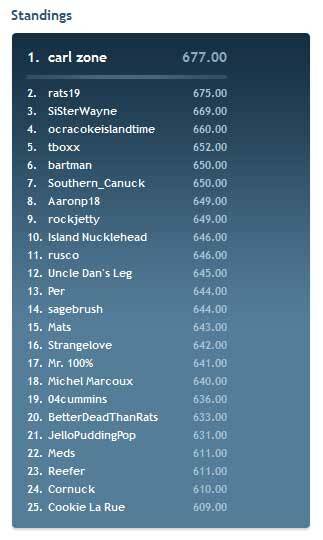 ATTN: Reefer2.....I may not win the pool but I certainly satisfied our bet requirement with a bit of room to spare. Remember its $50.00 to the site..
Can Rats hold on with 5 (FIVE!) injuries in his lineup?? ?